One year after introducing an all-new Civic sedan and coupe, Honda isn't resting on its laurels. Instead, it's doubling down on this best-selling compact car. The 2017 Honda Civic lineup expands with a stylish and practical hatchback, and Honda is broadening its appeal to driving enthusiasts with the availability of manual transmissions for the up-level turbocharged engine. 2017 Honda Civic coupe turbo. My vehicle is one of my favorite cars because it drives very smooth and is responsive. I love having the three options of driving modes which are econ for efficiency, drive for regular driving and sport for hilly terrain. I use sport when I am in the city and need quick acceleration and I use econ for long freeway drives. The look of the 2017 Civic coupe is very sporty and sleek with just the right combo of curves and angles for a pleasant aesthetic. The turbo is great as it gives me the boost I need to accelerate or climb hills at the a good speed. The interior is very modern and appealing. The touch screen console is perfect and I use the back up camera often. I have found many cars at this price do not come with standard sunroofs. I love this feature and it was one of my top deciding factors. I also enjoy the apple carplay option as well as the seat warmers. My only complaint is the angle of the front seats are far too curved. The seat cups my lower back while thrusting my neck and shoulders forward. This is a very poor posture and has caused me shoulder pain and neck discomfort. I love this car and its wonderful fuel efficiency but the discomfort of the seats would have caused me to buy a different car had I known they would be so poor long term. The 2017 Honda Civic is a dream car! I am totally in love with this car! It really spoils you. The keyless entry and start is so nice. My keys stay in my purse, which means they never get lost. The car automatically unlocks when I open the handle, it is a push button to start, then it automatically locks as I walk away. It is literally impossible to lock your keys in the car, and if you leave a door open, it will beep at you to remind you to shut it. The back up and right hand turn cameras are great too. No more wondering if the lane is really clear. The handy guidelines show exactly how much space you need. The heated seats, in-steering-wheel controls, and voice commands are nice too. I frequently use carplay to send text messages and call people, all without having to look my phone. The only downside is an intermittent issue I had with the radio display beeping at us, or sometimes now working at all. Also, turning your right turn signal on or shifting I to reverse interrupts car play. Oh, I forgot to mention, the car handles like a dream. Rain is no problem! Bottom line, I totally recommend the 2017 Honda Civic!! It gets really great gas mileage for it is class. I upgraded to this vehicle recently and I love it. It is very agile and picks up speed on the freeway like nothing. It is got a ton of great features inside, my favorite being the infotainment system. The screen is large and easy to use. I don't like consoles that have a lot of buttons that take your attention away from the road. I like the apple carplay feature as well, however, it would be even better if I could sync up wirelessly. However, when my phone is plugged in, it charges so that is a nice touch. I like that it is a sedan put has enough speed and agility behind it. I feel like I am not really driving a boring sedan. The vehicle is incredibly spacing as well. 4 tall adults fit with plenty of leg and head room. The one thing that bothers me about the car is that it is very low to the ground. I practically fall into the seat when I get in it and I have to hold the side of the door to pull myself out. Older people have a harder time getting in and out of the car than I do. 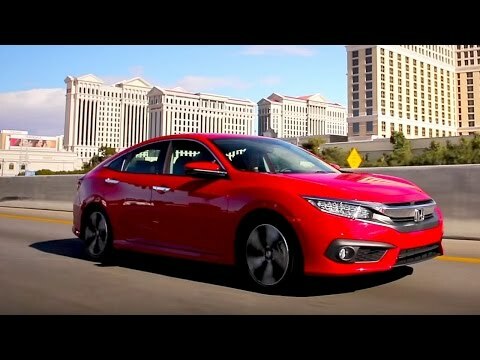 2016 / 2017 Honda Civic Review and Road Test | DETAILED in 4K UHD!